The imageRUNNER ADVANCE series is a holistic, integral multifunctional device designed to enhance your office document ecosystem in every way imaginable. It’s easy to oversee your entire imageRUNNER ADVANCE fleet. IT administrators can do their job even more efficiently through a variety of solutions, including iW Accounting Manager, eMaintenance, and more. Business can be simple with the imageRUNNER ADVANCE device. 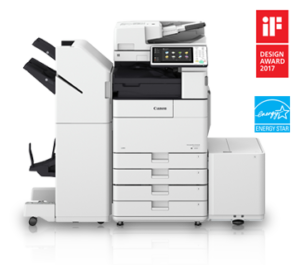 Designed to move at the speed of your business, it produces high quality output at high velocity, all while retaining the trademark Canon simplicity. Collaboration is power. The imageRUNNER ADVANCE range of devices is created to work together to enhance your office productivity in exponential terms. Integrated document solutions and features such as remote fax, network storage and even mobile printing – all working in synergy to enhance your business.